Billy Graham once dreamed of playing in the big leagues, so it seems fitting that he would be honored at a baseball game in his hometown of Charlotte, North Carolina. With the help of his grandson Will, the Charlotte Knights minor league baseball team will recognize Billy Graham on Aug. 20 during its “Faith and Family” game. Will Graham is expected to take a few moments before the start of Sunday’s game against the Lehigh Valley IronPigs to talk about his grandfather’s love for baseball and how that’s impacted his ministry. “This city is where he learned so many of the things that God has used to reach the world through him,” Will explained. “It was on the farm in Charlotte that he learned hard work. It’s where he learned humility. It’s where he heard the Gospel through a traveling evangelist and gave his life to Christ. In the past year, Will has preached the Gospel in Uganda, Scotland, Australia, Mexico and several states across the U.S. Later this year, he’ll head to Indiana, Romania and Canada. Billy Graham has written about his affinity for baseball, growing up playing “pitching ball” with neighborhood friends every chance he got. He later realized that his calling was to ministry, not sports—but somehow, the two could work together. “Since there were few things in life that I loved more than baseball, as a young man I dedicated myself to the sport and hoped that my passion for the game would lead me straight to the major leagues,” Billy Graham wrote in his book, Nearing Home. As he always does, Will Graham will also talk about the Gospel message that changed Billy Graham’s life and so many others. He says it’s “exciting” to be able to “put the focus on Jesus” outside of church. “I’m not naïve to the fact that there are many people who don’t or won’t go to church. That doesn’t mean that they aren’t searching for something, that they don’t have problems in their lives,” Will said. 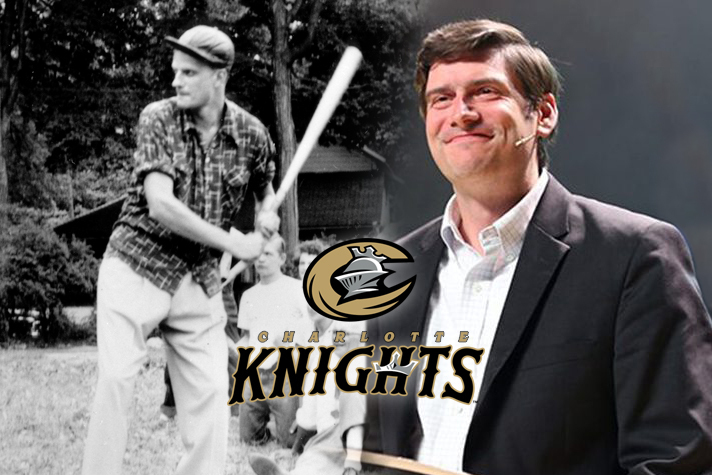 His hope is that through Sunday’s “Faith and Family” game, Knights fans who are also Christians will be motivated to share their faith in practical ways more often. “It is incredibly important—eternally important—to develop real and personal relationships with people, especially if that builds a bridge to sharing the hope of Christ with them,” Will explained. Still, the challenge is to not just build the bridge, but to cross it. And Sunday’s baseball game could be the perfect opportunity to do that. Hearing about Billy’s younger years is very interesting and encouraging!! The first time I saw Pastor Graham was at the Reno Coliseum in 1968 or 1969, Reno, Nevada. I was 18 years old at the time… he truly spoke To my heart!!! I thank God for him and his ministry! !